Pretty impressive right? The number one role of hormones is to keep things balanced. These little guys are powerful, and the littlest thing can throw that balance right off. Hormone balance is especially important when it comes to weight regulation. The hormones involved in this delicate balance include insulin, glucagon, and leptin. We will save cortisol (stress hormone) for another post. Let’s break these down one by one. Insulin: This is the one you have probably heard the most about. You might even know that it has something to do with blood sugar. You would be correct. Insulin is an anabolic (building or storing) hormone that is produced in the pancreas and it targets the liver, muscles, and adipose tissue (fat cells). Its role is to lower blood sugar (glucose) levels and to promote the formation of glycogen. 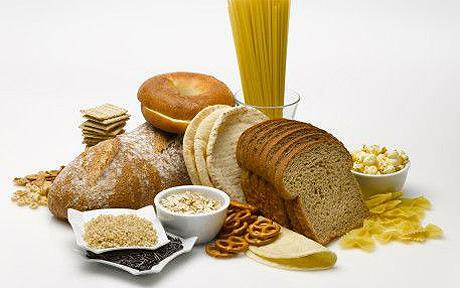 It mainly stores carbohydrates by burning carbohydrates and turning them into fat. Glucagon: Glucagon is a catabolic hormone that does the exact opposite of what insulin does. It aids in accessing energy that has been previously stored in the liver and fat cells and tells the body to release fat and stabilize blood sugar. It too is made in the pancreas. Leptin: Leptin is known as the “energy balance” hormone and the “satiety” hormone. It works by telling the brain how much body fat is stored and it regulates both energy intake and expenditure to help keep body fat levels balanced. When your diet looks like (the photo on the right) your body is having to release a lot of insulin to bring your blood glucose levels back down to a safe and normal level in the blood. When your body is producing a good amount of insulin from meal to meal and from day to day it is basically (as mentioned above) storing carbohydrates by burning them and turning them into fat. It simply makes you fat. To top it all off, when the liver and muscle cells become so full of glycogen any additional glucose circulating in the blood gets converted into triglycerides. High levels of circulating triglycerides in the bloodstream is linked to atherosclerosis which increases the risk of heart disease and stroke. See, it’s not fat in our diets that cause heart disease- it’s sugar. In contrast, when you eat a diet made up of quality meats, fats, vegetables, and moderate fruits the opposite will happen. You will burn fat. This is true because the body is not being overloaded with carbohydrates so it is not producing large amounts of insulin and is instead being able to release fat from cells. Glucagon is stimulated by low blood sugar levels and protein intake. It is not able to work appropriately when there are elevated insulin and free fatty acids (triglycerides) in the blood. Imagine your brain is blind, unable to see your chubby reflection in the mirror or the creeping number on the scale. It needs leptin to give it the facts it can’t see. So until the brain hears leptin say, “Ok, we’re fat enough,” the brain is going to keep telling you to eat more and move less, to ensure your survival. If this continues (and most likely it will if you do not decide to eat a different way) the blood will continue to be saturated with high blood glucose and eventually your pancreas will give up and give out. When the body can no longer produce insulin at the rate needed to manage blood sugar a pretty common thing will happen. It’s a little disease we like to call Type 2 Diabetes. It is important to mention that while we are just discussing the role of a high carb diet on leptin there are also other factors that come into play that throw this hormone off balance. These include: sleep deprivation, alcohol consumption, excess polyunsaturated fats, stress, and toxicity. We can touch on those another time! Eat foods that help the body release fat instead of hindering it. Eat foods that keep your blood sugar levels even and steady which reduces the risk of developing chronic diseases and aids in helping you feel your very best! No more crashes! No more feeling addicted to food. If you choose a diet of real whole foods lower in carbohydrates it will aid in keeping the body in proper balance, which ultimately helps with weight loss and weight maintenance. Have you struggled with fat loss? Let us know what you think and if you have personally found yourself dealing with these issues?